Are you one of those who find it a pain to start/stop MongoDB server from the command line or perhaps looking for a better alternative or in particular wish you do it through a UI? And are you a Mac user? Then, you might love MongoDB Preference Pan for the Mac. Its a utility that you can install so that the much needed start/stop functions can be performed via UI with Mac's System Preference pane. 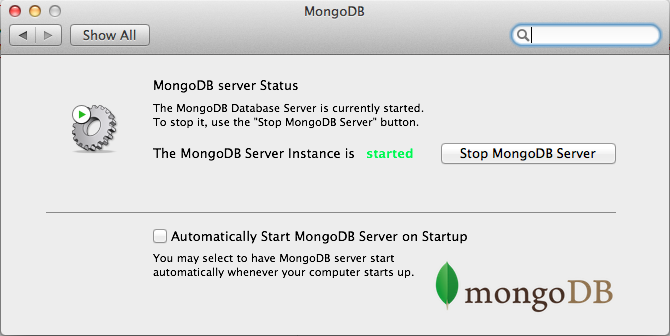 As a bonus, you might even start your mongodb server instance on system startup by a simple check-box selection. Unzip the downloaded file (likely named MongoDB.prefPane.zip). Simply, double-click MongoDB.prefPane and you're all set.